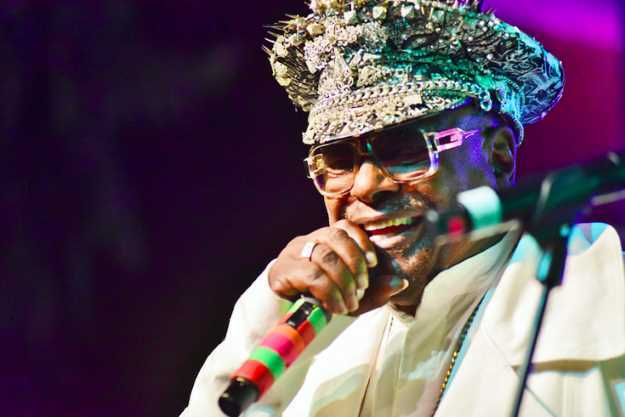 In 1977, when Parliament Funkadelic’s “Give Up the Funk (Tear the Roof Off the Sucker)" was filling arenas in every American town, I hitchhiked from Boulder to McNichols Arena on a snowy Halloween to see George Clinton and P-Funk in their platform shoes, wide-feathered hats and diapers. Forty years later, Clinton, at 76, is still tearing the roof off. And I had to ask him about what he calls his third comeback. “It’s been a family affair,” Clinton tells Westword. Today, the Prime Minister of Funk performs with his backup-singing grandchildren. “I do have one son who is a computer nerd who plays heavy metal guitar. Another is a rapper, like Lil Wayne.” His kids have names like “God’s Weapon,” "PopUlar" and "Nakid 87." Even Clinton rhythm guitar player Garret Schider is the son of Garry “Star Child” “Diaperman” Schider, who was the band’s musical director until he died of brain and lung cancer in 2010. Clinton says his family inspired his latest renaissance, which begat Parliament’s first new studio album in over thirty years. Medicaid Fraud Dog includes the hit song “I’m Gonna Make U Sick O’ Me (ft. Scarface)," which has the rolling beat and guttural lyrics of the ’70s P-Funk sound. But this number is not about a smothering romance, as its title might imply. The song is a sermon against the pharmaceutical industry, which Clinton compares to a pusher. Speaking of legal drugs, will Dr. Funkenstein be glad to visit Colorado, where, unlike in his native Florida, recreational pot shops line the streets?